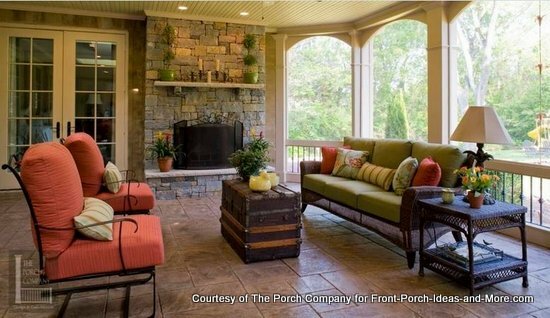 Nancy Moore founded The Porch Company in Nashville TN, and has been building custom porches since 1992. The Porch Company is one of our fine sponsors. Nancy is an energetic and talented lady who absolutely loves porches and shares her best tips to help you think through the details of planning your porch. 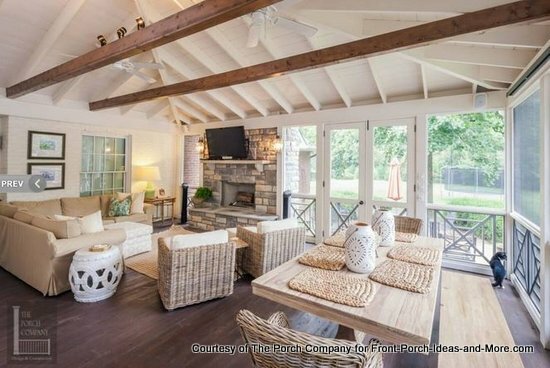 From working in high heels at IBM to building porches, Nancy shares tips for planning your screened porch after having designed and built hundreds of custom porches in the Nashville, TN area since 1992. Nancy's enthusiasm for porches is contagious. She is an absolute expert in the topic of porch planning. Dave: Today we're very fortunate to have Nancy Moore, the owner of the Porch Company, with us. Nancy is the Warren Buffet of porches to us and so we're very excited to have her here with us on our porch. Nancy has a wonderful story of how the Porch Company came to be and so, Nancy, welcome to our porch, and perhaps you will share with us how you got started. Nancy: Thank you for having me. The Porch Company is about 22 years old now and I was right out of college working for IBM, had a great job, enjoyed it but I had this undeniable urge I wanted to build, I wanted to create wonderful spaces. This was an urge I could not deny and my newlywed husband was unhappy when I said I want to quit this wonderful job and I wanted to go into construction. And he did everything he could to talk me out of it but I couldn't deny that urge so since I knew nothing and was completely unemployable, what you do but buy an old house and you start to fix it up. So that was a great experience, learned a lot of things. Had some good successes, had some disasters that first year and just realized how ignorant I really was. But just do a lot of on the job training and after five years of dabbling in the construction industry like that and paying my dues by learning my lessons, I decided I needed to focus on something. I thought what in the world I am going to do? And I thought, well, I could do decks, those were easy enough. And I finally concluded no, I don't want to do decks. I'll do porches. 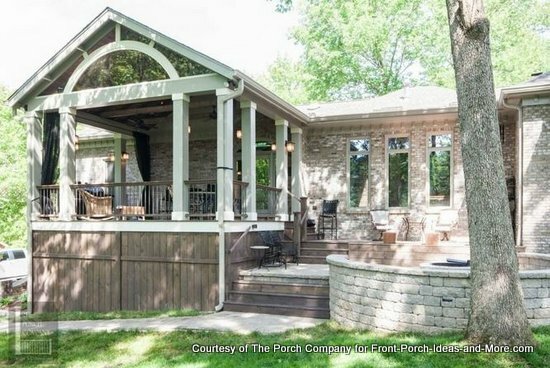 Nancy: So The Porch Company was born with very little planning and very little strategizing and who knew that porches could be an industry unto themselves. But they are. Mary: Thank heavens! Just tell us a little bit about your company today. Nancy: Right, the first year of my great experience was that we built three porches that first year and we were busy the whole year round. Now we build three porches a month. Nancy: So again, a huge learning curve has happened and of course the porches we build today are much more elaborate and much more well thought out and much better than we did that first year. But it is just a matter of learning how to do things, then you get efficient and you hire more people and yes, that first year there was myself, one other carpenter and half way through one other carpenter. So there was three of us in the porch. Today, we say if Nancy has a hammer in her hand, you know something has gone drastically wrong. So I am not out there to build; I am on the design side of that these days. Mary: Talking about building porches, what kind of porches do you build? Nancy: To us the definition of a porch is any kind of an outdoor structure with a roof, that's the key that is the distinction between a deck and a porch. We build anything that can be considered a porch whatsoever. 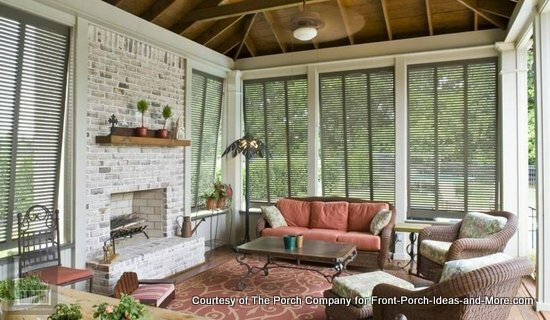 So open air porch, screened porch, porches with temporary screens. We don't do glassed-in rooms. We say they have to have walls that breathe is our term. So we do not do sunrooms but we also do pergolas and any other outdoor structures that are similar in nature to porches. Dave: So from what we have seen, you have built some wonderfully custom-designed screened in porches. Porches that, oh boy, almost everybody would want one of those. Dave: So what are some things that someone should consider when contemplating having a screened-in porch built? Nancy: Ok, well from the homeowner's perspective. First of all it is nice if you can find somebody who has built a screened porch before. Because as we all know experience is the best teacher of anything. So there is a big difference between building a porch and building a sunroom. And the difference is water. Water gets in on a porch. Sunrooms - they do everything they can do to avoid water ever penetrating walls. Well, on a porch you know water is going to penetrate the walls. So how do you deal with it? How do you deal with water when it comes in? So that is by far the most important thing that you need to consider or the builder needs to consider. You really need to make sure the builder realizes that. So having things like making sure the water drains off the porch, having big overhangs, having lots of gutters, avoid gable roof spacing that blowing wind. You know you just need to consider where is the water going to come from, where is it going to land and how is it going to get outside of the porch. So that is a very practical thing that you need to consider to begin with. Mary: Those are good tips Nancy, because I think a lot of homeowners are just thinking about what am I going to put on my porch and what am I going to do on my porch. They don't necessary thing about something as practical as water. To keep it out the porch. Nancy: Right. And really to be on your porch in the middle of the rainstorm is wonderful. Wonderful, but if that rain blows in on you and you can't be out there, thinking about water on your porch is very important. Mary: So tell us about some other considerations. Nancy: Ok, now the next thing you want to consider is perhaps the size and the location of your porch. You see I always start with functionality. Because if it doesn't function, I don't care how pretty it is, it is a big waste. So you want to make it functional so you need to think about the size, how many people are going to be using this porch, how much furniture do you want to have on that porch, what activities are you going to be doing out on that porch? Most people want to have a living space and a dining space. Some people also want to have a game room space, great place for your checkers or outdoor card games or those kinds of things. Some people want to have a big open space but they've got small children and that want to be able their children just be able to run. So you really think about your lifestyle and how you would best use that space. Mary: And that would probably quantify what the size of the porch should be and maybe how it should be planned out, right? Nancy: Correct, that would definitely affect the size of the porch. The other thing that can be really important is where do I locate that porch on my house. Every now and then I get somebody who wants a little private porch off their bedroom. Great, they realize that is not a public space. That is just for your use. 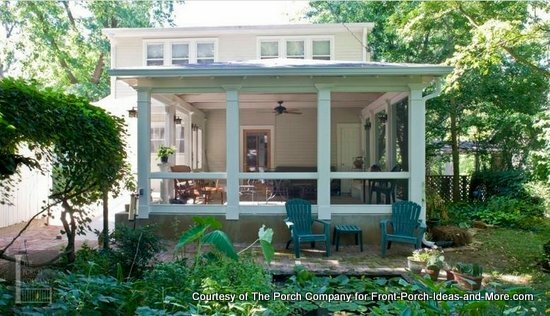 Most people want their porch off a public space. The closer you can get the porch to the main room or the kitchen or whatever room you live in the most, the more often you will use the porch. And the other thing we would like to do is do is for the most part, we like the porch to be at the same floor level as the interior of the house. Again you'll feel more integrated. The more integrated it is, the more it will become part of your daily lifestyle. Alright so those are two functional things. The rain first and then size and location. And then thirdly, I start to consider the aesthetics of the porch. Alright now that I know where it is located and how big it is, now I can determine what's the best roof line that is appropriate for your house. That is from an architectural perspective, to make it look like it goes with your house, the roofline is the most important thing. The second most important thing is just selecting your paint colors that blend with your house, most people we tell you know your exterior trim will end up being what we paint the exterior of your porch. And then it looks like it goes with your house. You'll often see porches built as if it were a deck that wasn't even stained perhaps and is just raw wood. It may look great for you but it never looks like it was original to the house. It will always look like an add on. So you would want to at least paint the exterior of your porch to blend with your house so it will look more like it was built with your house. Dave: If you can, let's go back to roofs for a second here. This is really stickler for us because we get asked a lot of questions from our site visitors about they want to add a porch or a screen porch. They send us a picture of their home and it will be a situation where are you have an L-shaped home, two gable roofs coming together. And the front door is in the corner and that makes that a real tricky situation. Nancy: It is very tricky, and we literally all the time would get called out to a house. We have five people out here; everybody says I can't do this. Of course you can and here is how you can and we usually always can come up with a solution. Every now and then you have to say this is not a good thing. This is not going to enhance your house. Dave: You can put a roof on it but it just won't look very good. Nancy: Right, most of the time we can but they are tricky and there are a whole lot of builders out there and when it comes to tricky they just really get cold feet. And I understand that because tricky is tricky. Nancy: First one on those roof lines, you can mix gables and hips and sheds and you can mix roof lines really easily and make them look great. And most of the time, I'm going to by trying to get to hip roof on a porch. The advantage to a hip roof, you get that overhang on all sides you get gutters on all sides. Therefore you are going to capture most of the water so that water is not going to blow into your porch. So it is a very, very practical roofline for a porch because we are typically are doing vaulted ceilings and we are leaving our framing exposed. It is very pretty framing; it's got an interesting geometry going on. Nancy: So we love to do a hip roof. Our second most common roof would be the gable, which is everybody else's first most common roofline. It is a great roofline and it is very pretty. I think most United States the wind kind of blows from the southwest going northeast. So if you have a gable facing west, you are going to get so much rain blowing in there if it screened up there. That's not a practical solution. So either you finish that off in some kind of siding or however you want to do that perhaps put a small amount of screening window or something up there or some light and some air. But just be careful about south and west facing gable roofs. Mary: If I could Nancy, could I go back for just a minute to the location of the porch? Mary: If the homeowner could put their porch on any side of their homes that they wanted, what are some of the considerations they should take into account especially when talking about the breezes like you say, where the direction your house faces as far as the sun goes. Nancy: You know I don't think that really matters. A lot of people like the house on the western side because they are trying to shade the interior of their home and the porch roof would do that. But the bottom line is the porch needs to go where it needs to go and as long as we got some nice cross breezes. You know often we go build into an "L" of a house and you can't get a lot of cross breezing so we just add extra fans and do whatever we do to get the air movement up. We can usually make any direction work. So usually people don't complain about too much sun on the porch and if they do, we've got solutions like curtain and shutters and different things like that that we can do to block some direct sun, if it is too much but generally people are not concerned about too sun on the porch as they are inside their house because they are worried about fading their upholstery or their curtains or things like that. That's not such an issue on the porch. Mary: So the bottom line is that you need to put your porch where it needs to go as far as functionality and usability with your family and your guests and everything. Nancy: That would be my recommendation. Dave: So let's just change gears here and let's focus on the amenities. What are some of the more popular amenities people are looking for? Nancy: Before we kind of built the porches and let the clients add things but we've gotten more and more involved in those things. Of course the first one is the fireplace. I bet on fifty percent on our porches we put a fireplace. And then on the fireplace there is gas burning or there is gas ventless or wood burning. We actually do more gas ventless because they are less money and because we don't need to put a chimney on. They are more functional in that the heat immediately comes on by the remote control. You don't have to wait for it to start up. Also as you leave the porch you don't have to worry about the logs burning down. So very functional from that perspective. You do not get that wonderful smell that you get from a wood burning fireplace and that's the main draw of the wood burning fireplace, it is just that authenticity and the wonderful odors. And there are other people who hate the smell of smoke. So it is kind of funny. Anyway fireplaces would be the number one amenity that we add to every porch. Well, what we discourage is any kind of grill or cooking on a screened porch. We will do them sometimes on open air porches but inside a screen porch it is hard to get that smoke out of there. If you do any kind of grill or cooking, you do have to have these big commercial grade exhaust vents which are very expensive and they are not effective because the wind can just overpower them very easily. So I do my best to encourage people to put those things off the porch in some location. Outdoor wet bars of some sort whether it be just for handling beverages or having water accessible are great but you have to worry about having indoor cutoff for the winter time; you don't want your pipes to burst. So those get to be kind of troublesome and people if they don't cut them off they forget and ultimately their pipes burst and they got water over the place and there is a big mess. So you've got to think about that. I am very functional and very practical so I tend to try and talk people out of it unless they would really would like that. Outdoor curtains have become most popular in the last couple of years that make all kinds of wonderful fabric. Any kind of polyester fabric that is made for outdoor use is wonderful and they can just soften the look of the porch as well as be functional for a privacy standpoint or from the sun. If it is low in the afternoon and you are trying to avoid that western sun before your curtains cross. Mary: And why did you mention polyester? Nancy: Just because it is good outdoor material. Mary: Ok. It probably dries quicker. Nancy: It dries quickly and it is fine for it to get wet. It won't do the watermarks and those kinds of things. The other thing that we are doing is the All Season Curtains, which are our plastic curtains. Mary: Oh those are your signature curtains. Nancy: They are, something that we've come up with to solve the problem. There are a lot of people out there doing that but we think we've made plastic curtains as pretty as you can make. For other people it is purely functional and ours are functional but I think they are pretty too. So those are great because they help keep your porch dry and it help keep the heat in the wintertime and it also help your porch clean. And then the other thing that is so fun are the swing beds. Mary: Ohhh, oh my gosh! 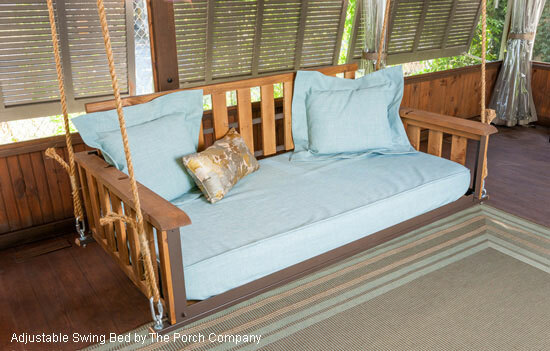 Dave: Going back to functionality in designing your porch is to make sure that it is large enough for a swing bed. Nancy: That's right, and that goes back to deciding on your furniture. Actually ours are very unique and again we are really proud of them. We did build them ourselves and we've got different models and styles. The size of our swing beds is like a twin bed. Alright it is very large and if you were to sit on that you cannot put enough pillows behind you to get that comfortable. So what we did is we made our back adjustable so it can be moved up into different notches. Then is is comfortable to sit on. Or just move the back and it will be comfortable to take a nap in. Mary: Sounds to me like a porch swing or it can be a swing bed. Nancy: Oh you absolutely can, but I do spend Sunday afternoons always on my swing bed lying down reading a book or whatever napping. Or whatever and it is just delightful to just be gently swinging. I know how to just touch my foot on the floor and keep it going just a little bit. You hear the noises of the birds and everything else outdoors. You get a little breeze going and it is just good as it gets here on earth. Mary: You also have bedding. Nancy: Yes, well you know when you sell something you realize that your customers say "where do I buy this?". So pretty soon you'll say ok I will just do all this. So yes we have the mattresses now, we have mattress covers, we have pillow covers, we have ropes that you can hang it with. You know we have those various components that go with that. Mary: That's the ultimate in comfort (laughs). 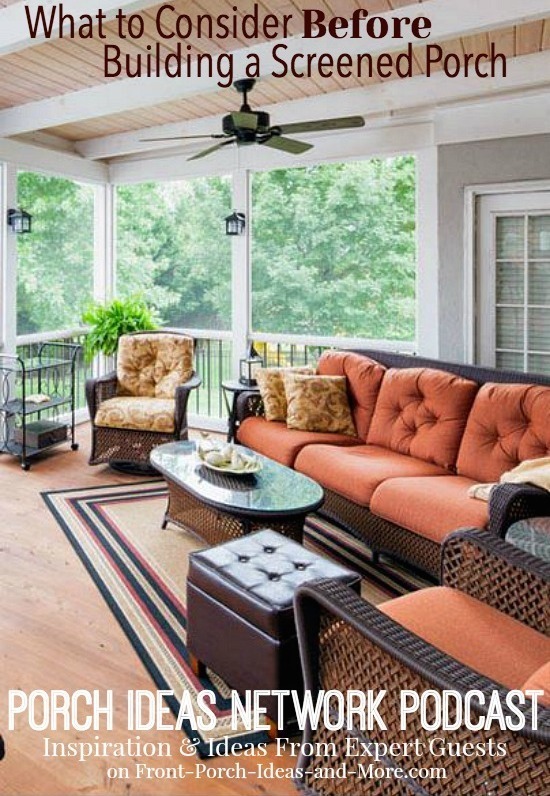 I know another thing that we would love on our screened porch would be fans. Nancy: Absolutely, to have the breezes going. Mary: To have the breezes going. Nancy: Fans are essential to a porch. Especially I know in Nashville in August, if you don't have some air movement, it just can be miserable. So the more the better. Now typically you are going to put one to two to four fans on the ceiling of your porch, which is great but I have found it is also nice to augment with some floor level fans and they make some pretty ones now. Nancy: And every time that fan hits you, it is just like ohhhh and it would go away and it would hit you again, right? (laughs). But anyway maybe it is a nostalgic memory for me but I love to have that floor level fan as well. So make sure when you do your electrical for your porches you put some outlets in your posts. You cannot have too many outlets. But a floor level fan if you cannot get to an outlet, that's frustrating. Please add those outlets to your columns. Mary: So another thing to take into consideration when designing your screen porch would be lighting. Mary: And what kind of porch lighting options are there, Nancy? Nancy: Oh, they are so many and lighting does set the mood. So whatever lighting we do, we put everything on a dimmer switch. So it will always be on a dimmer no matter what it is. Even floodlights I would put on a dimmer switch. But what we like to do on our porches because we do have our vaulted ceilings we do like to have some up lights that would shine up on that ceiling and spill down and is every nice soft light. So the way we achieve that is using the LED strip lights which never burn out. They are very, very low light and we put them on our horizontal beams which are color types that shines up so you can't actually see the source of the light whatsoever. I used to use this glow on our pretty ceilings, that's a lovely light and because we have these exposed-rafter ceilings most of the times, we can't use these recessed cans because we don't have a cavity. So we end up mounting light features on the post like exterior light features like you would have inside your front door something like that. So we would put multiple of those inside the room of course on our dimmer switch and then we have the additional plugs so people love to put little lamps on tables and those kinds of things. So there are a lot of different sources of lighting and everything does need to be appropriate for outdoor use because it potentially can get wet and we typically don't put lights on our ceiling fans although certainly an acceptable way to achieve some lighting. Mary: So Nancy you are based out of Nashville Tennessee. So if some of our listeners would like to get in touch with you about having you build a porch for them, how would they do that? Nancy: Well, first I would say please go to our website because we have thousands of photographs. Well, maybe hundreds of photographs out there and that's porchco.com - The Porch Company - porchco.com. Or you can call us directly at 615-662-2886. The website has just got a wealth of information and we would want you to go there first to get an idea of what we can do for you. And then you'll know more when you come and talk to us. Mary: Well we are so delighted that you spent time today with us Nancy. Mary: And we would love for you to come back. Nancy: Thank you. I would love to come back. Appreciate it. Dave: Oh, that was great having Nancy on the porch with us today. Well, she does build some beautiful porches. Mary: Oh she sure does and it would be really fun to have her back to talk about her open air porches too. Dave: Oh yeah, her Porch Store, too. Mary: And the Porch Store, well, that would be wonderful! Dave and I have known Nancy almost since we created our site. 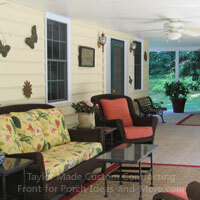 She is not only a talented designer and builder of porches, but she also relates so well to her customers. A true porch lover herself, Nancy enjoys her own screened porch and says on Sunday afternoons you can find her at home taking a nap on her adjustable swing bed. Nancy's passion for designing and building porches is undeniable. We love the quality she puts into her work and the amount of respect she has for her customers. First class in all respects. 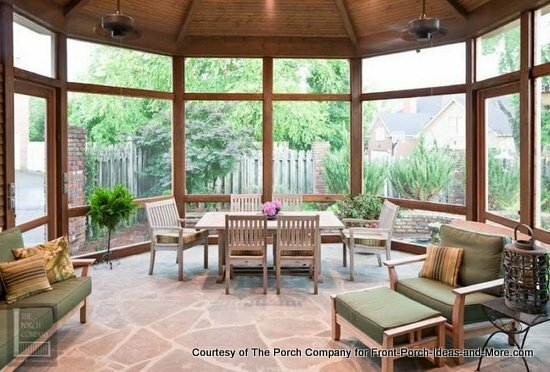 If you are thinking of a new screened porch for your home, take a look at The Porch Company website for some wonderful ideas and smart tips on their blog. 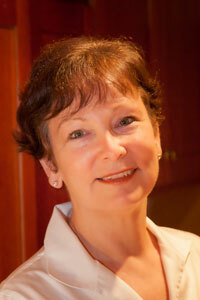 If you live in the Nashville TN area, be sure to contact Nancy for a porch consultation. 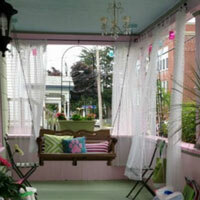 We also feature Nancy's company in our Porch Ideas Network where you can see some of their wonderful porch designs. Absolutely stunning, actually.